For our fifth anniversary, Bonnie and I wanted to spend the weekend in Northwest Georgia, including hiking around Cloudland State Park. We previously visited Cloudland Canyon several years ago, when we were both out of shape. We wanted to visit the canyon again, with the hope that we could cover much more ground with our newfound fitness. About a month ago, I received an e-mail from the same group that organized the Chattahoochee Road Race in March, advertising the Tear Drop Half Marathon. 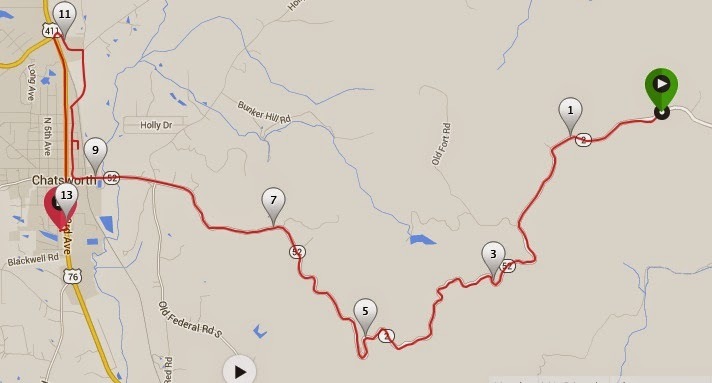 They advertised a downhill route, in fact 8 straight miles of downhill with over 2000 feet descent in elevation. The race site had a link to lodging in the area, and there were several options for some nice cabins at a reasonable price, which happened to be near the start of the half marathon. 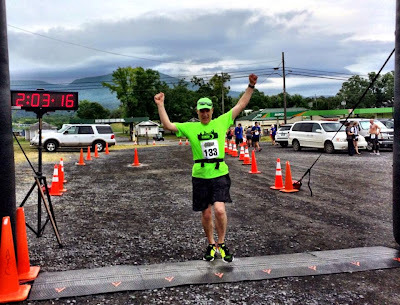 Even though the cabins were more than an hour's drive from Cloudland Canyon, I could get a 10% discount on the cabin rental with a code from the Tear Drop Half Marathon. So what did I do to celebrate our anniversary? I registered myself for the half marathon, registered Bonnie for the 5K in Chatsworth, and reserved the cabin near the top of Fort Mountain at a 10% discount. How things have changed since our heavier days! On Saturday we did much more hiking and explored the park to the fullest, although we may have walked much further than recommended on the day before a half-marathon. for a half-marathon, but we were rewarded with great views. 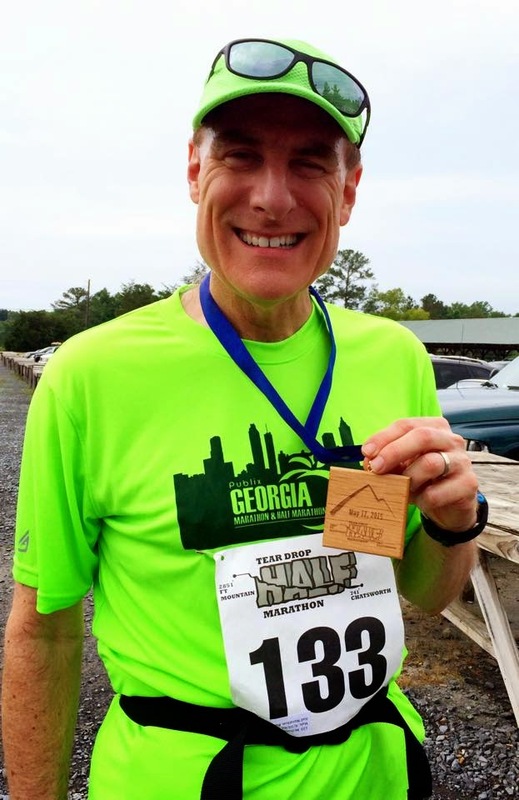 Since finishing the Publix Georgia Half Marathon in March, I've been working on the Hansons' Half Marathon training program. It's pretty intense, with running prescribed for six days of most weeks, although the daily distances in the beginning aren't too long. The Hansons' philosophy is one of cumulative fatigue, gradually adapting the body to running a lot, but spreading out the distance fairly evenly, so that a weekly long run should be no more than 25% of the total weekly mileage. During the semester, it was a challenge to schedule in the daily runs, but I did fairly well nonetheless. At this stage, I've finished the first seven weeks of the program. Although I don't really feel faster, I do feel stronger, and with careful attention to post-run stretching and evening foam roller sessions, my legs are holding up fairly well, in fact better than earlier in the year. On the morning of the race, we met in Chatsworth at the finish line for packet pickup. While we were waiting for the bus to take us up the mountain for the start, it started raining! Fortunately we were able to take shelter under a carport at the Super 8 motel, where I took my first beet juice shot, to kick in for the first hour of the run. When the bus arrived, it was nearly 7 am, and it took 20 minutes to get to the top. There was one more bus behind us that didn't arrive until around 7:35, 5 minutes after the scheduled start. As soon as the last bus unloaded, I took a second beet juice shot, hoping it would carry me through the second hour of the race. We gathered at the starting line, and I saw the race director climb up on a truck holding an airhorn in her hand. Without any ceremony or pre-race announcements, she sounded the airhorn, and the race had begun! and then ca. 2.1 miles due south on 3rd Avenue, the main drag of Chatsworth, to the finish. 3) I should forget about walking the next day. So I took a cautious route to running the downhill part of the race. I resolved to take a walk break every half-mile, and to keep a reasonable pace until I reached the bottom, so that I would give myself every chance to run the last five miles without too much difficulty. I had set my Garmin for a 9:10 pace (what is needed for a 2 hour finish), and heart rate alarm to signal about 170 beats per minute. For the first few miles I was consistently slightly ahead of the pace, but slowed to the desired pace in the fourth mile, and slower than desired for the rest of the way down. The walk breaks slowed me down but were also a welcome change of pace for my legs. 2 miles down, 8 miles to downtown Chatsworth, and 11.1 miles to the end! Shortly after the mile-5 marker, a woman caught up to me to ask how much time had passed since the start. (45 minutes) She was in the port-a-potty when the race had started, and virtually everyone had disappeared when she stepped out! But she had caught up with me by that point. For the most part, people behind me were catching up to me and passing me, but I was happy with my progress nonetheless. I took my first gel in the sixth mile, about 50 minutes in, as planned. After about six miles, I was feeling some tightness in my quadriceps, but occasionally running a few steps with exaggerated high steps, and taking a few leg stretches during the walk breaks while continuing to move forward helped a great deal. Shortly after passing the mile-8 sign, the road leveled out, then even went uphill for a short bit. I was remarkably happy to be running uphill for a change! The Stallion gas station was at the bottom of the downhill stretch. Seeing the courthouse in downtown Chatsworth meant less than five miles to go! Shortly after passing the mile-9 marker, we made a right turn onto Fourth Avenue. The road was level at first, and I passed a couple of people in the first few blocks. At that point, my heart rate monitor began chirping at me for the first time in the race. I took a short walk break on a modest uphill section, took my second gel, again approximately according to plan, then jogged again. As we passed a park in the center of Chatsworth, the route turned to the right, going uphill! Another right turn and we ran a level stretch of about one hundred yards, before making a U-turn to retrace our steps to return to Fourth Avenue. It was really tempting to cut the route a bit short, but, I didn't. By this point the battery on my cellphone was dead, so no more photos from me for the rest of the way. There was a large cluster of runners about one hundred yards in front of me. It seemed that I was very gradually closing in on them, although I would then lose a little ground when I took walk breaks. The heart rate monitor was occasionally chirping at me, and so I was taking walk breaks every few minutes, more often than I had on the mountain. Around this point, I remember thinking that I will never be strong enough to run a full marathon. At the mile-11 marker, I completed my first mile slower than 10 minutes, in fact the time was 10:32 :(. But as we turned toward Third Avenue, I carefully crossed a set of railroad tracks as the police held traffic in the busiest intersection in town for me to run through - thanks! Only two miles to go! I ran 8 miles downhill, with heart rate consistently in the 150 - 160 bpm range. Then I got into the relatively flat final five miles in town, and my heart rate soared. Third Avenue had appeared to be level when we had driven the street on Friday evening, but this morning it had gentle but noticeably rolling hills! But I was making progress on some of the runners in front of me. Approaching the final water stop somewhere in the 12th mile, I took my third gel, and washed it down with one cup of water and another cup of Gatorade. 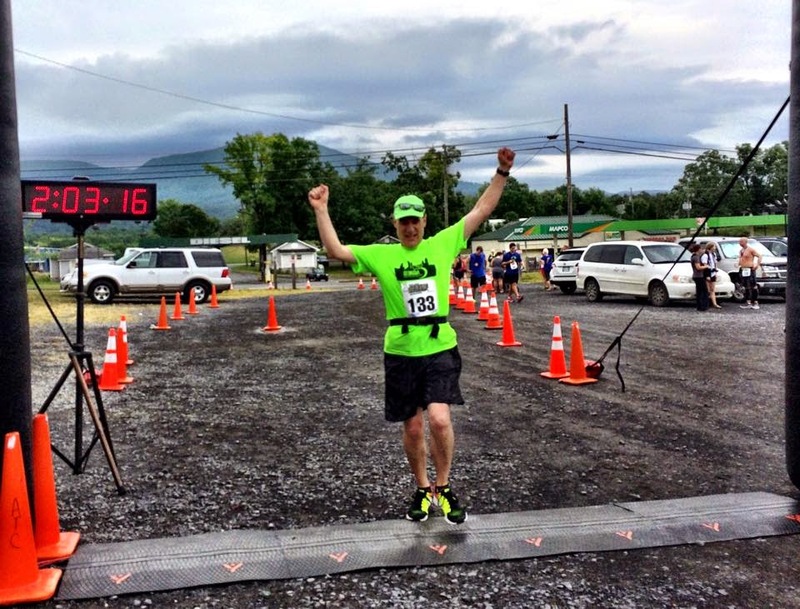 Seeing the mile-12 marker, I resolved to run the rest of the way in to the finish. At times it was difficult to maintain my resolve not to take another walk break, but I was gradually catching up with and passing other runners, which kept me going. My heart rate monitor was chirping away so much that I could hardly keep track of my pace, but I knew that I was on track to break my 2:05:36 personal record if I just kept moving as strongly as I could. Crossing the intersection with highway 52, just three more blocks to go. I passed another runner and kept moving forward. Then I could see Huddle House on the left side of the road, which meant that the Super 8 motel across the street was coming up soon! People were clapping on the lawn in front of the Super 8. I gave them a smile and two thumbs up, as I dug in for one last sprint, turning into the parking lot. 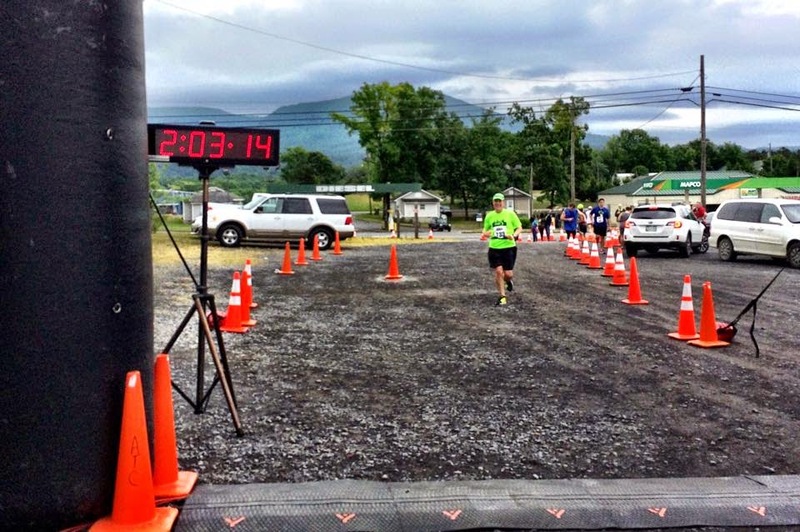 The finish line clock showed 2:03:10 as a runner in front of me crossed. I could see Bonnie on the other side of the finish line, taking my photo as I approached, with the clock reading 2:03:16 as I crossed! A new personal record, by more than 2 minutes! 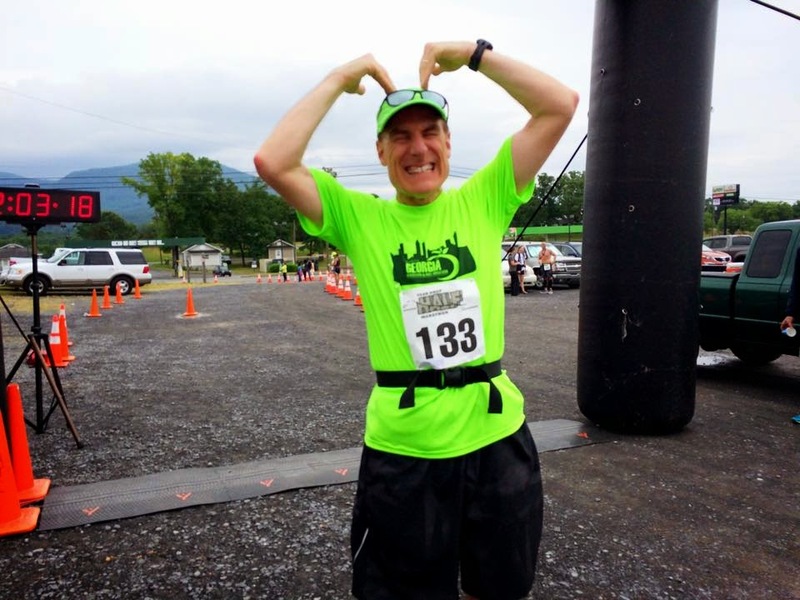 I did my best "Mobot" pose for the camera, and a volunteer handed me the medal, actually a woodcarving! Goal C: To get down the mountain without hurting anything; Achieved! Goal B: To save enough energy in the first 8 miles to run a good pace for the last 5 miles in the town of Chatsworth; at least the last mile was strong, so I'm happy with that. 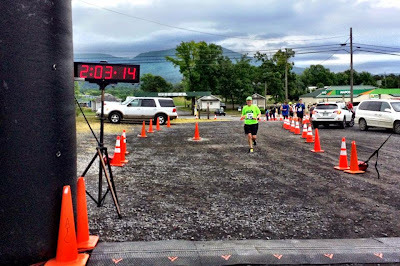 Goal A: To improve on my current PR time of 2:05:36; Achieved, at 2:03:09!!! That's a cool finisher's medal, er, wooden? I would run in the race just for that. Congrats!